Robert Levinson of Coral Springs disappeared during a business trip to Iran's Kish Island in March 2007. The U.S. believes the private investigator was abducted and is being held in Iran. An FBI poster showing a composite image of former FBI agent Robert Levinson, right, of how he would look like after five years in captivity, and an image, left, taken from the video, released by his kidnappers, Tuesday, March 6, 2012, in Washington during a news conference. Four Florida lawmakers are calling on Iran's government to uphold its offer to help find a retired FBI agent believed to be detained there. 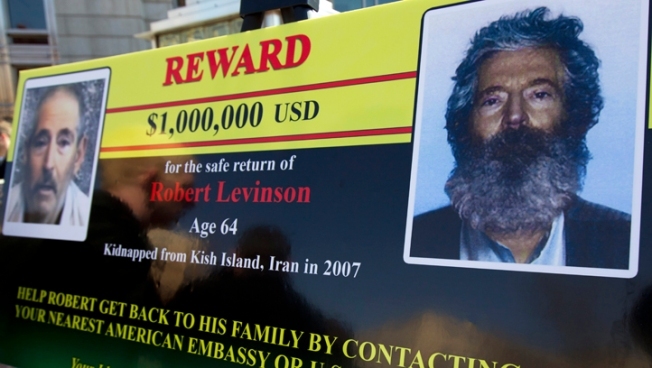 Democrats Sen. Bill Nelson and Rep. Ted Deutch and Republicans Sen. Marco Rubio and Rep. Illeana Ros-Lehtinen introduced a resolution this week urging Iran's government to cooperate in the case and return Levinson home. Levinson's case was a topic in recent negotiations between U.S. and Iran aimed at addressing Iran's nuclear program and improving diplomatic ties. The White House last month appealed to Iran to return him and two other Americans being held there.